*Oat flour is available in health food shops and online, but if you cannot find it substitute gluten-free plain flour instead. 1. Preheat the oven to 180°C (350°F) Gas mark 4. Put the bread and oat flours in a large mixing bowl and add the bicarbonate of soda/baking soda and the salt. Add the buttermilk and milk and mix to form a soft dough. If it is too sticky, add a little more flour but don’t overwork the dough – as there is no yeast, you need to keep the mixture as light as possible. 2. Form the dough into a round mound, about 4cm high and 20cm in diameter. Cut a cross on the top of the loaf with a sharp knife and dust the top with a little extra flour. 3. Put the loaf on the prepared baking sheet and bake in the preheated oven for 45–55 minutes until the bread is crusty on top and makes a hollow sound when tapped. The bread is best eaten on the day you make it, but can be reheated in the oven the following day. 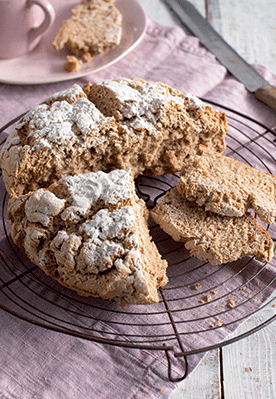 Recipe taken from The Complete Gluten-Free Baker by Hannah Miles. Photography by William Reavell. Published by Ryland Peters & Small. The Complete Gluten-Free Baker will be available to YHL readers for the special price of £11.99 including postage & packaging (RRP£16.99 by telephoning Macmillan Direct on 01256 302 699 and quoting the reference HT9).